I have always been a keen swimmer and always loved the great outdoors. Never in my widest dreams did I ever think I would be putting the two together. 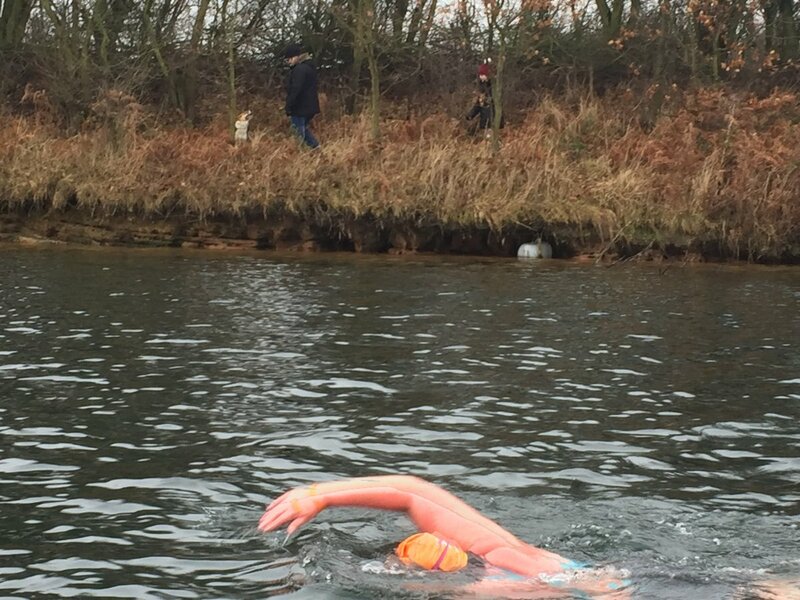 In March 2014, my friend Janice and I ( who have a nasty habit of getting drunk and setting stupid challenges together) decided to try open water swimming to help with Triathlon preparation. Janice had done a number of triathlons previously, but I was seriously overweight and felt far more comfortable lolloping in the water than out of it. After an initial swim at 10 degrees, ( neoprened up to the MAX!) Janice and I both agreed we were idiots and decided to come again the following week. As any open water swimmer knows, the initial reaction to the cold water, and the endorphin rush that goes with it are addictive. We returned week after week and really started to enjoy the summer months. In August 2016, I swam Lake Windemere (10.5miles) and decided I needed a new challenge. 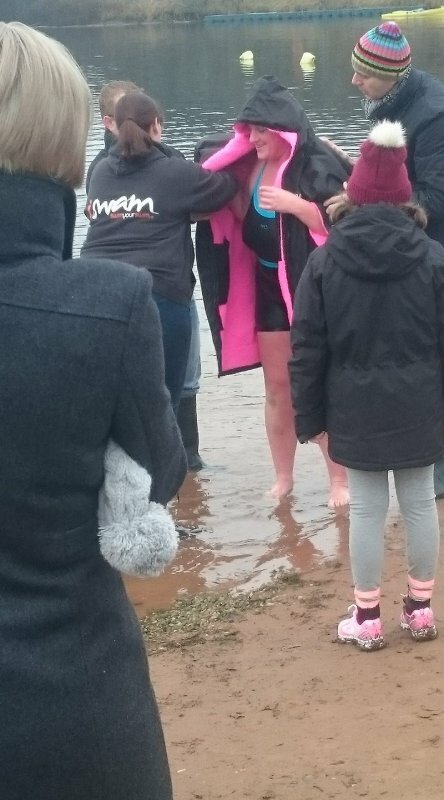 Having never believed I would be able to complete Windemere in the first place, I signed up for the next challenge I could never see myself doing - The coveted Ice Mile. I am extremely lucky to have 3 excellent swim coaches who not only have their own ice miles under their belts, but know how to have fun with it too. Saturday mornings stripping down to swim in skins over the winter turned out to be the highlight of each and every week in 2016, and the date of 18/2/17 was set for my Ice Mile attempt number one. Christmas came and went, and after having a 4 week break, I was getting a little scared of getting back into the water. Of course I would - it hurt! 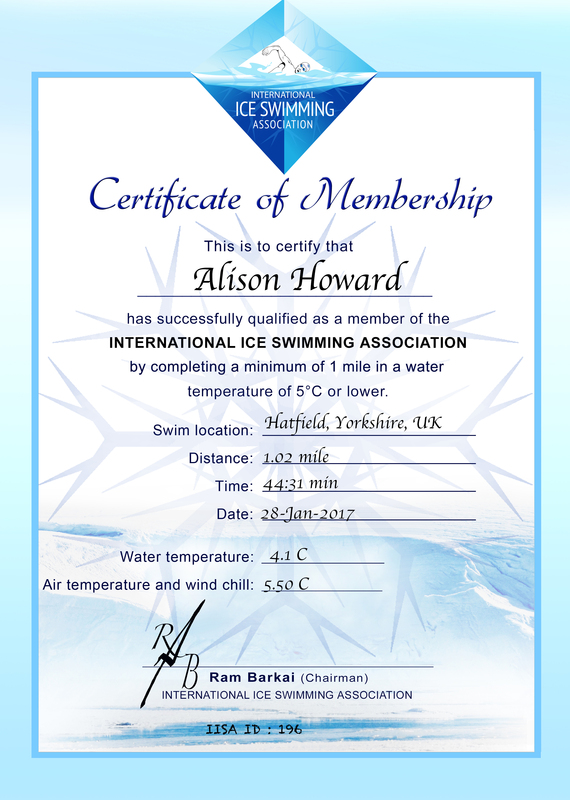 I was encouraged to complete my qualifying swim on a week where we had only a couple of Ice Mile attempts at Hatfield, and after a 4 week break, I sailed through the 1km qualifier. Now I never really shiver much in cold water. That day however, I had a brief out of body moment in recovery. That was my first and last reaction to the water temperature we get at Hatfield. The following week, I was given 24 hours notice that there was only 1 ice miler entered for that Saturdays swim, so I might as well get in and get on with it. That approach actually works very well for me, as I have less time to think about it and talk myself out of it. The actual swim on the day was fantastic. It was a chilly overcast non-descript English morning ( not a snow covered icicle or sun drenched frost morning I had hoped for) but I had a fantastic group of friends come to support me. 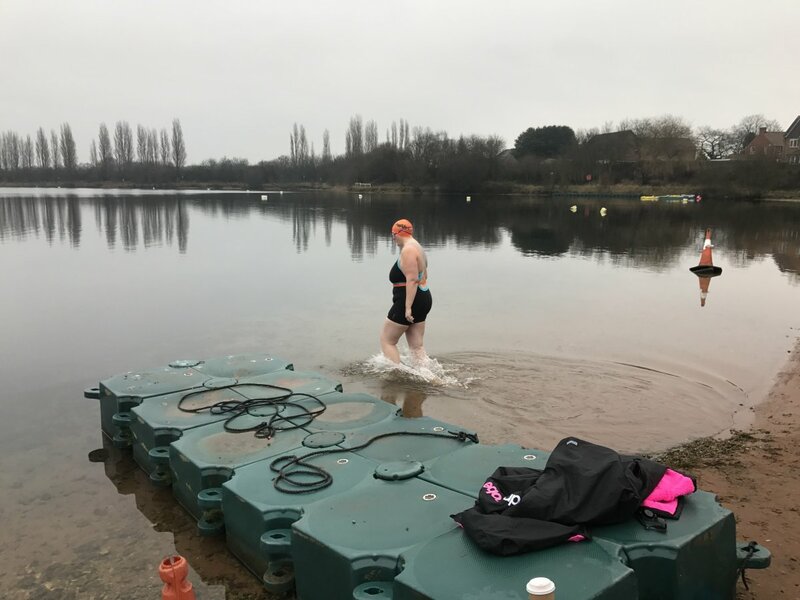 I thought I might get the brain freeze that has seen so many strong and experienced open water swimmers decide to try again on a later date, but I either got lucky, or I got hypothermia and remained oblivious! I loved every part of my swim: the initial pain, the adjustment phase, the breathing settled and then it was just me, the breaking water and feeling every inch of my skin come alive with the exhilaration. I absolutely thrived on it. Just at the last corner, where a few swimmers have decided to end their swim this year, I knew It was nearly over, and I genuinely did not want it to be. I stopped briefly to take in the surroundings, I could hear my dog barking his support from the shore, and hear the engine of the boat nearby and just took a moment to savour the experience. It was quickly interrupted by my coach Leon telling me to shift it and keep my arms turning. In my little reverie I misunderstood his intentions and thought he was going to tell me my swim was over. I quickly rallied and said \'No Im good, I got this\' and carried on. In hindsight, this was more easily misinterpreted than my initial reality check, and I have subsequently received an abundance of abuse from my fellow swimmers regarding quotes you dont normally hear during an ice mile - but It all adds to the camaraderie that we have in our swim club, and why I drive a 2 hour round trip every Saturday to join them. 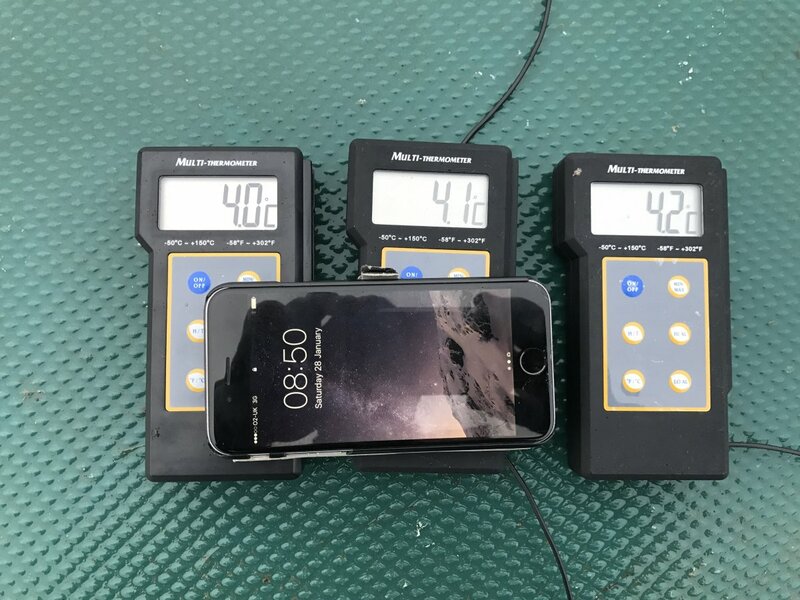 My recovery was swift and painless, and I did shiver like a good \'un for a few minutes, but at 4.2 degrees, its certainly not the coldest ice mile on record. I have been back in the ice water since, still in skins, and I am part of a relay team hoping to complete a channel swim in July 2017. 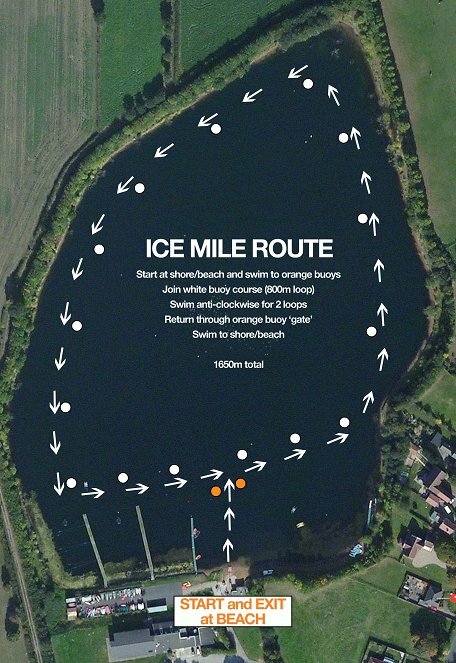 I will definitely do another Ice Mile - but will need to up the stakes for a better challenge, some picturesque scenery and perhaps a holiday out of it. Better go find Janice and stock up on some Gin . . . .